A retrospective exhibition celebrating the work of renowned Egyptian visual artist Reda Abdel-Salam is scheduled to open at Cairo's Gezira Art Centre on 18 January. Titled "Free advancement in the spaces of experimentation, abstraction and expression," the exhibition is organised by the Fine Arts Sector and will be inaugurated by the head of the sector Khaled Srour. 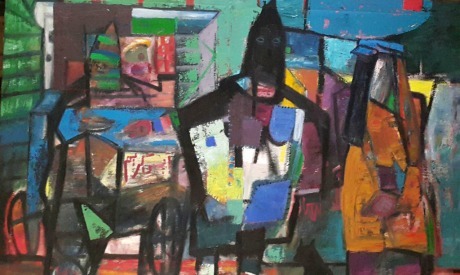 The exhibition comprises a varied collection of works created by Abdel-Salam throughout the years and ranges from expressionism and abstractionism to collage and journalistic drawings that together reveal important moments in Abdel-Salam's artistic career, all in addition to a new collection of works that will be exhibited for the first time. Srour commented on the exhibition by saying "once more Abdel-Salam offers us with a new exhibition of his artistic experience…an experience that inspires contemplation and awe, and which [over the years] witnessed relentless attempts for experimentation in search of a harmony between authenticity and modernity." Born in Suez governorate in 1947, Abdel-Salam is a professor of photography at the Faculty of Fine Arts, and is a member of multiple artistic associations. He authored five books and many critical studies, and has over the years received various awards. Abdel-Salam has exhibited his work in many countries including Egypt, Italy, Kuwait, Azerbaijan and Hungary.